Pathogens and disease. A disease is any condition caused by the presence of an invading organism or a toxic component that damages the host. In humans, diseases can be caused by the growth of microorganisms such as bacteria, viruses, and protozoa. Bacterial growth, however, is not mandatory to cause disease. For example, some bacterial pathogens cause disease by virtue of a toxic component of the bacterial cell such as lipopolysaccharide. Finally, the damaging symptoms of a disease can be the result of the attempts by the host's immune system to rid the body of the invader. One example is the immune-related damage caused to the lungs of those afflicted with cystic fibrosis, as the body unsuccessfully attempts to eradicate the chronic infections caused by Pseudomonas aeruginosa . Not all pathogens cause diseases that have the same severity of symptoms. For example, an infection with the influenza virus can cause the short term aches and fever that are hallmarks of the flu, or it can cause more dire symptoms, depending on the type of virus that causes the infection. Bacteria also vary in the damage caused. For example, the ingestion of food contaminated with Salmonella enteritica causes intestinal upset. But, consumption of Escherichia coli O157:H7 causes a severe disease, which can permanently damage the kidneys and which can even be fatal. Types of bacterial pathogens. There are three categories of bacterial pathogens. Obligate pathogens are those bacteria that must cause disease in order to be transmitted from one host to another. These bacteria must also infect a host in order to survive, in contrast to other bacteria that are capable of survival outside of a host. Examples of obligate bacterial pathogens include Mycobacterium tuberculosis and Treponema pallidum . Opportunistic pathogens can be transmitted from one host to another without having to cause disease. However, in a host whose immune system is not functioning properly, the bacteria can cause an infection that leads to a disease. In those cases, the disease can help the bacteria spread to another host. Examples of opportunistic bacterial pathogens include Vibrio cholerae and Pseudomonas aeruginosa . Finally, some bacterial pathogens cause disease only accidentally. Indeed, the disease actually limits the spread of the bacteria to another host. Examples of these "accidental' pathogens include Neisseria meningitides and Bacteroides fragilis . Spread of pathogens. Pathogens can be spread from person to person in a number of ways. Not all pathogens use all the available routes. For example, the influenza virus is transmitted from person to person through the air, typically via sneezing or coughing. But the virus is not transmitted via water. In contrast, Escherichia coli is readily transmitted via water, food, and blood, but is not readily transmitted via air or the bite of an insect. 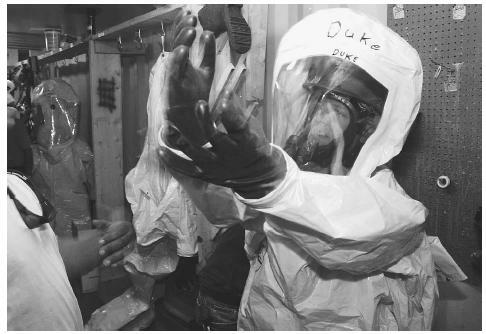 A worker gets into his chemical protection suit before entering an environmentally sealed tent at Area B-11 on the grounds of Ft. Detrick, Maryland, during a chemical cleanup operation. While routes of transmission vary for different pathogens, a given pathogen will use a given route of transmission. This has been used in the weaponization of pathogens. The best-known example is anthrax. The bacterium that causes anthrax— Bacillus anthracis —can form an environmentally hardy form called a spore. The spore is very small and light. It can float on currents of air and can be breathed into the lungs, where the bacteria resume growth and swiftly cause a serious and often fatal form of anthrax. As demonstrated in the United States in the last few months of 2001, anthrax spores are easily sent through the mail to targets. As well, the powdery spores can be released from an aircraft. Over a major urban center, modeling studies have indicated that the resulting casualties could number in the hundreds of thousands. Contamination of water by pathogens is another insidious route of disease spread. Water can look crystal clear despite the presence of millions of bacteria in each milliliter. Viruses, which are much smaller, can be present in even higher numbers without affecting the appearance of the liquid. Thus, water can be easily laced with enough pathogens to cause illness. Pathogens can be transmitted to humans through contact with animals, birds, and other living creatures that naturally harbor the microorganism. The agent of anthrax— Bacillus anthracis —naturally dwells in sheep. Other examples include Brucella abortic (Brucellosis), Coxiella burnetti (Q fever), and viruses that cause hemorrhagic fevers such as Ebola and Marburg. Pathogenic mechanisms. Microorganisms have various strategies to establish an infection in a host. Some micro-organisms recognize molecules on the surface of the host cell, and use these as receptors. The binding of bacteria or viruses to receptors brings the microorganism in close contact with the host surface. The nature of the interaction between the host receptor molecule and the attachment molecule on the surface of the bacteria, virus, or protozoan has in some cases been defined, even to the genetic level. The use of recombinant DNA technology—where a target section of genetic material is removed from one organism and inserted into a certain region of the genetic material of another organism, in a way that does not affect the expression of the gene—allows the genetic manipulation of a microorganism so as to enhance its ability to cause an infection. Alternatively, inserting a gene that codes for a toxin into a bacterium that is a normal inhabitant of an environment like the intestinal tract could produce a formidable pathogen. This altered bacteria would readily associate with host cells, but would also carry the toxin. Some viral pathogens are capable of causing a disease long after they have infected a host. This delayed response occurs because the viral genetic material becomes incorporated into the genetic material of the host. Thereafter, the viral genetic material is replicated along with that of the host, using the replication enzymes and other machinery of the host. But, in response to a number of signals, the viral material can be excised from the host material and form the template for the manufacture and assembly of new virus particles. A prominent example of such a virus is the Human Immunodeficiency Virus, which is acknowledged to be the cause of Acquired Immunodeficiency Syndrome. Centers for Disease Control and Prevention. "Disease Information." Special Pathogens Branch. July 26, 2002. < http://www.cdc.gov/ncidod/dvrd/spb/mnpages/disinfo.htm > (28 December 2002).